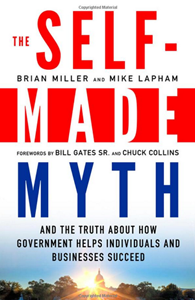 Over on my Facebook page, someone pointed out a review of a new book called The Self-Made Myth: The Truth About How Government Helps Individuals and Businesses Succeed. Not having read the book, I don’t know whether it or the review itself is more grating, but I bet it’s close. The review, at least, is an exercise in question-begging, gratuitous assumption, and the broken-window fallacy. The reviewer evidently absorbed the entire seventh-grade lesson on the benign nature of government and its passionate crusaders for justice. Not even a tinge of curiosity about alternative points of view, or concern that the way government portrays itself to the public may not in fact be the whole story. The review proceeds under the premise that were it not for government providing A, B, or C, then A, B, and C would not be provided. If there were no government-funded road connecting Sears to that apartment complex, we’d presumably all be standing around like doofuses, scratching our heads and wondering how on earth to get those dishwashers to our dwellings. It further assumes there is no moral argument involved when people with guns and badges expropriate peaceful individuals. Consequences are all that matter. It assumes that successful individuals owe that success to government “services” that they had no choice but to pay for, and in many cases no real choice but to use. It assumes government has not hindered business in any way, or at least in any way the reviewer bothers to disclose to us. So the taxation, the inflation, the business cycles, the subsidies for inefficient production at the expense of the efficient, the Alice-in-Wonderland antitrust litigation, the regulation — another 70,000 to 80,000 pages worth per year (all of which is necessary to keep us from instant death, you understand) — none of this ever hindered anyone. None of this is worth mentioning, since, hey, some guy found some useful information in a brochure published by the Small Business Administration. It is oblivious to how wages and living standards rise, and calls for the very things that retard that process: increased income and capital-gains taxes, minimum wages, more spending on “education” (how much spending on education could ever be enough, I wonder? ), etc. From the early 1970s to 2003 alone, [education] spending per capita doubled…. Meanwhile, Japan, spending one-third as much per capita, and with much larger class sizes, vastly outperforms the U.S. The review has absolutely no inkling of how regulation — which, we are quaintly told, is just there to keep us all from dying — is used to inhibit competition, and is lobbied for by business firms themselves. Tim Carney does some good work on this in his book The Big Ripoff. The Small Business Administration, touted in the piece, has an atrocious record. Naturally it will have some successes — giving certain people special privileges at the expense of others is bound to bear some fruit for those so privileged, but there is obviously no non-arbitrary way by which we can declare that the SBA-led outcome is economically superior to the outcome that would have occurred without it. We need “trust” in the marketplace, says the reviewer. Of course, the real problem has been too much trust — thanks to the SEC, investors have failed to do their due diligence. Why, if the SEC can’t find anything wrong with Bernie Madoff, he must be a fine fellow! What private certification firm could survive a scandal like that, much less wind up with a bigger budget? It seems to be taken for granted that the very infrastructure of society owes itself to the state. Our reviewer would be puzzled, no doubt, at the development of merchant law in the Middle Ages, which occurred without state involvement and extended to a variety of peoples scattered across a vast expanse. This is exhausting, so feel free in the comments to hit on anything I didn’t cover.